Minimum of 250 pieces per item. Our machines: standard straight stitch, sergers: 4 and 5 thread, double needle, merrow stitch, blanket stitch, cover stitch, satin stitch, zig zag, and button hole. Our equipment includes: cutting tables and industrial knives. 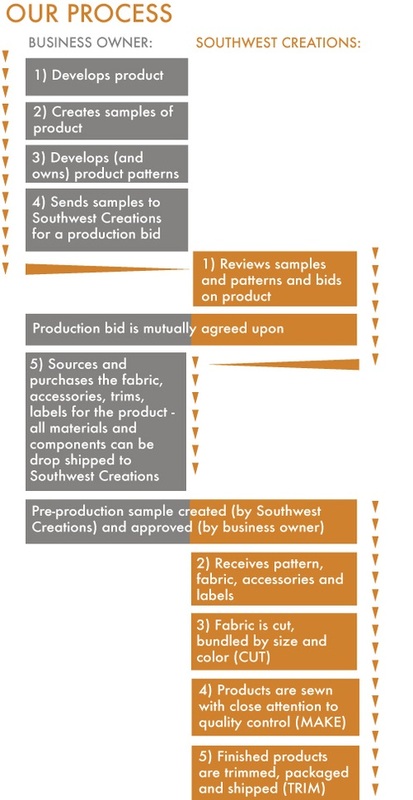 We're happy to discuss your project specifics such as colorways, sizes and thread changes. Are you interested in working with Southwest Creations? Please complete this form and we will respond ASAP. If you'd like to contact us directly, please call either Susan Matteucci or Shirley Grisham at 505.247.8559.